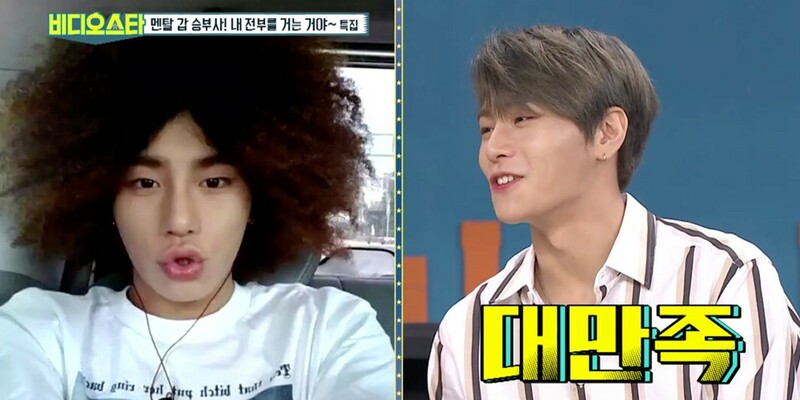 JBJ95's Kim Sang Kyun appeared as a guest on MBC's 'Video Star' on October 23, alongside Shaun, J-Black, and Woo Ji Won! As many of you know, the idol will be making his third debut soon through his new duo JBJ95. Kim Sang Kyun honestly opened up about his upcoming debut with the MCs and fellow guests of 'Video Star', and also revealed that JBJ95 decided to change the title of their debut song because of Shaun! Why? Originally, JBJ95's debut song was called "Way Back Home", but due to Shaun's "Way Back Home" still remaining a huge chart topper, the song's title was ultimately changed to simply "Home"! In addition, Kim Sang Kyun addressed his crazy hair styles from his Topp Dogg days. He shared that he disliked his short bob hair, which he had for 2 years after his debut, because it was forced on him by his company. However, he decided to get his hair curled in a poofy afro-style all on his own! Finally, Kim Sang Kyun named Block B's Zico and his own father as his two biggest role models, who influenced his life in positive ways. Check out Kim Sang Kyun's 'Video Star' clips below!